It seems these days like some breweries are in an arms race to see who can fit the most hops into their beer – often without any attempt at balance or even palatability. This ‘trend’ has led to a lot of the IPAs on the market being more about chest-thumping than about good beer. This is not one of those IPAs. 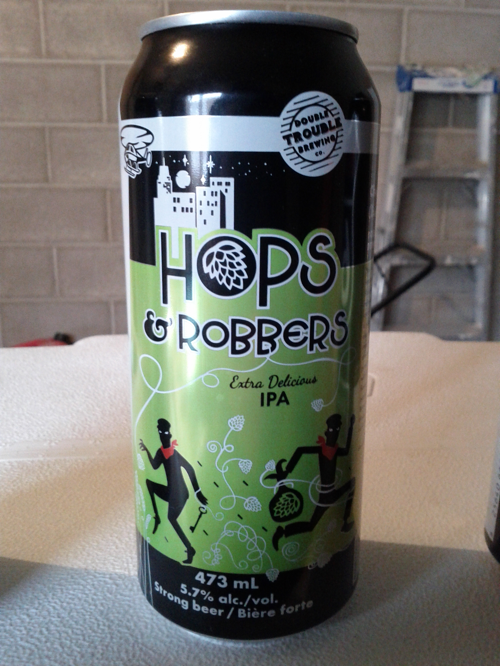 Hops & Robbers is closer to a classical IPA than some of the modern renditions. A burst of hop aroma hits you in the face when you open the can & pour. The beer pours with a nice off-copper colour and a light white head. As with most American-style IPAs (this one’s brewed in Canada), cascade hops dominates the aroma. As is typical of the style, the beer is heavily hopped, featuring good hop bitterness, flavour and aroma. But despite the high hop levels, everything is nicely balanced. The bitterness is on-spot, and lingers nicely into the after taste. The company claims 50IBUs, and I would believe that. Not overpowering, but noticeable and enjoyable The hop flavour is strong, but well balanced by a modest maltiness. As you would expect, the aroma througout the pint is dominated by cascade hops, and the flavour persists to the end of pint, providing a nice spicy/citrusy finish to every sip. All of this hoppiness is built on a beer with enough maltiness to carry the hops and provide enough mouthfeel, but not so strong as to detract from the good hop balance or to make the beer overly heavy. Next time I’m looking to buy some beer I’ll be looking for some Hops Robbers! Boneshaker is the opposite of Hops and Robbers – this is a kick-in-the-nutsack IPA aiming to emasculate you with every hoppy sip. Amsterdam makes no ‘bones’ about their goal with this beer – hops, hops and more hops. And after that, some more hops. But where many breweries fail, Amsterdam has succeeded. As this beer is bottled on lees, careful handling is a must. When you crack the bottle the escaping CO2 carries out a punch of hop aroma – I’ve opened up bags of hops with less aroma than a bottle of Boneshaker! Boneshaker pours with a light brown/dark copper colour, and produces an off-white head that doesn’t quit. The whole time you’re pouring the aroma of Amarillo hops punches you in the face. I was nervous to take the first sip – the power of the aroma made me suspect that my tongue was about to be assaulted by a pallet-destroying bitterness with resinous overtones. Instead, the high bitterness of this beer (and it is high) is balanced nicely by a heavier body than is normal for an IPA. At 7% alcohol, the maltiness and high bitterness blend together flawlessly. The beginning of the sip is bitter, but this fades to a pronounced hop flavour dominated by citrus overtones. Somehow, Amsterdam avoided the resinous flavours you sometimes get from too many flavour additions, and managed to cram a lot of hop flavour into this beer. Overall, a great IPA. But the high alcohol content and dominating hops flavour and bitterness, mean you’re not going to be drinking too many of these in a row. 666’s tag-line is ‘The Devil Made Me Do It’. 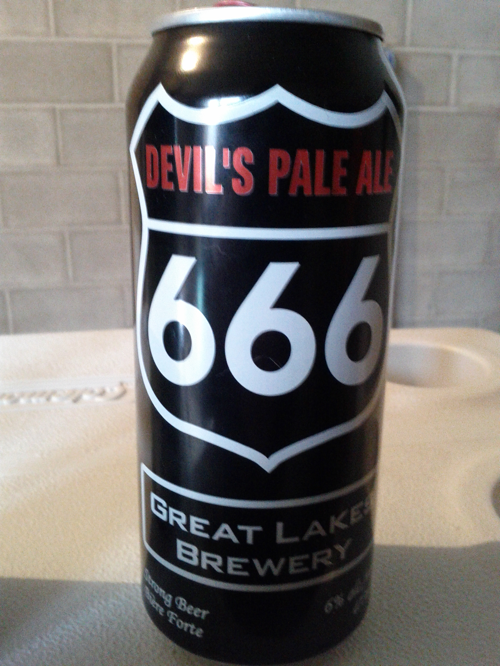 If the can is to be believed, there is 666kg of malt, 66.6kg of hops, the beer was boiled for 66.6 minutes and the beer was conceived on 6.6.06. While I cannot attest to the veracity of the claims, I can say this beer is devilishly good. Bad puns aside, this was a different beer than I was expecting. It pours dark-brown with a creamy-white head. This is a very malty ale – almost stout-like in body, but dark-brown in colour and with a flavour profile more like a conventional ale. It reminds me of some of the heavier scottish ales, but the flavour profile is unique enough to not fit that mould. Whatever hops went into this brew must of have been lower in IBUs, as the bitterness is in the background and not as upfront as I was expecting given the claims on the can. Despite being 6% alcohol, this beer goes down smooth. This is a good malty-sweet beer for sipping on a cold winter night, or after shovelling the driveway. 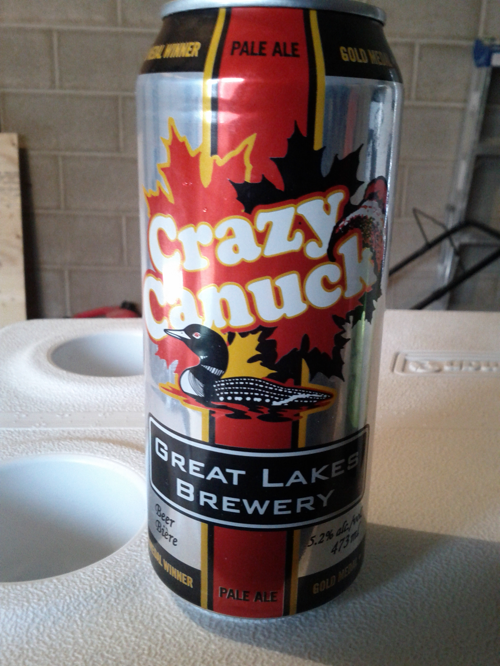 The final beer is another from Great Lakes, this time their Crazy Canuck. CC walks the line between a conventional ale and an IPA – a hop flavour and aroma akin to an IPA, but a bitterness closer to that of a bitter. The beer pours with a light copper colour and a modest white head. A modest, but notable hop aroma rises from the glass, but becomes less pronounced as the pint is emptied. There is a noticeable bitterness on the beginning of the sip, which seems to both become more dominant and yet somehow more balanced with the beers maltiness later on. The bitterness and maltiness forms a foundation of a very strong hop flavour – I’m not sure which hop was used in this beer, but I suspect Cascade or a similar hop, given the spicy-citrus notes in the hop flavour. The beer finishes with a soft aftertaste dominated by lingering hop bitterness. A very nice, and very drinkable, pale ale.